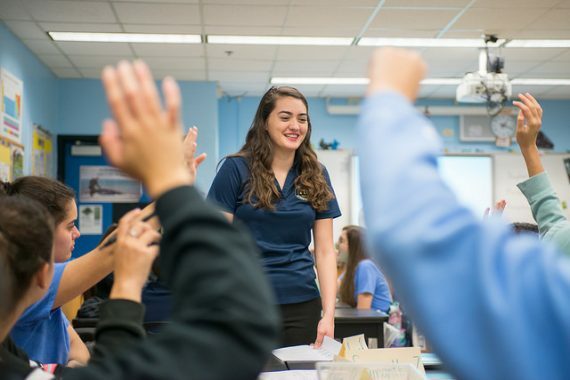 When students see their science classmates as very interested in the class, they are more likely to develop an interest in science, technology, engineering and math (STEM) careers, according to the national study led by FIU professors Zahra Hazari and Geoff Potvin. Excitement is contagious in a science classroom and could lead to greater interest in science careers, a new study has found. This infectious trend can also help improve grades. When students see their science classmates as very interested in the class, they are more likely to develop an interest in science, technology, engineering and math (STEM) careers, according to the national study led by FIU professors Zahra Hazari and Geoff Potvin and published recently in Science Advances. How a student perceives the level of their peers’ interests has a significant effect on their science career choices even after accounting for differences in their prior interest in STEM classes, their level of family support for science, academic achievement, gender and quality of teaching. Hazari and Potvin led the project, which included researchers from Oklahoma State University, Northwestern College, Purdue University and the University of Virginia. They surveyed more than 2,000 students at 50 randomly selected colleges and universities across the United States. This positive effect was consistent across biology, chemistry and physics classes and was seen for both students’ career interests and, in most cases, their grades. Even students who had little prior interest or support in science showed greater interest in science careers when they saw high levels of interest in their classmates. Hazari and Potvin, members of FIU’s STEM Transformation Institute, plan to follow up on their research with studies geared toward understanding how teachers can better create classroom environments where students feel motivated and confident in tackling more complex problems or experiments.